THERE is a tendency through enthusiasm for the new season to read an awful lot into one or two results. Aberdeen’s opening- day battering by Dundee United last season was soon long forgotten. In that vein, neither set of supporters last night should be too angst-ridden after taking just two points from the first three games. Clearly, though, there is improvement needed in both camps. The injury-ravaged hosts –still missing influential figures in Aaron Doran, Gary Warren, Richie Foran and Josh Meekings – were unchanged from Saturday’s draw in Perth. Iain Vigurs, the released former Motherwell midfielder, went straight onto the bench after signing yesterday morning. Hughes, though, gave the nod to the same starting line-up that had impressed at St Johnstone on Saturday before conceding a late equaliser. Juventus and France superstar, after his substitute’s bow against Celtic. Guinean exiting injured after just 18 minutes. 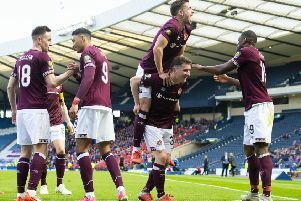 Partick had no cause to tread with trepidation in the Highland capital, having bucked the trend of Caley Thistle’s fine form last season with three league victories from three against the Highlanders. In fact, they have claimed one away victory in Inverness each of the three seasons the two clubs have shared top-flight status. Most memorably of all, they had thrashed Hughes’s side 4-0 here last December. Having opened at a very healthy tempo, the home side hit a brick wall early on and found Partick’s threat growing as the first half progressed. The best of the Glasgow team’s efforts saw Sean Welsh flash a header just over and fire another attempt over the crossbar in quick succession midway through the first period. Possibly the chance of the half, though, came Partick’s way almost on half-time. Stuart Bannigan’s pass through the middle released Kris Doolan into space. The substitute striker drove low to Owain Fon Williams’ right, but the Wales international squad goalkeeper dived to touch it around the post. Steven Lawless certainly did his best to enliven matters just before the hour. The Partick midfielder let rip from the edge of the penalty box and, again, it was keeper Fon Williams who spared his new club with a tremendous touch onto the bar. Vigurs’ entrance as a 64th- minute substitute marked his first appearance for the Highland team in six years and, within two minutes he had been booked. More usefully, Vigurs sent Dani Lopez through to be thwarted by Tomas Cerny on one occasion and swerved a free-kick towards the bottom corner that Cerny brilliantly palmed away. It was ragged and breathless towards the end as play raged end to end and chaos on both boxes produced a succession of half-chances. Caley Thistle’s Williams summed that up perfectly with a shot blocked at one end and then producing a saving tackle to deny David Wilson’s blast at goal for Partick.